Channing Frye looks ready to rock the Garden for years to come. Frye, a standout at Arizona, was picked in the first round, and eighth overall, in the 2005 NBA Draft. Halfway through his rookie season, Frye is averaging 14-plus points a game and pulling in six rebounds per game. 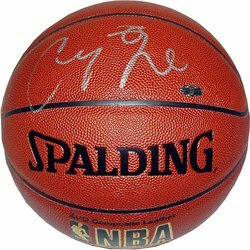 Channing Frye has hand signed this Indoor/Outdoor NBA basketball, which comes complete with a Steiner Sports Certificate of Authenticity.